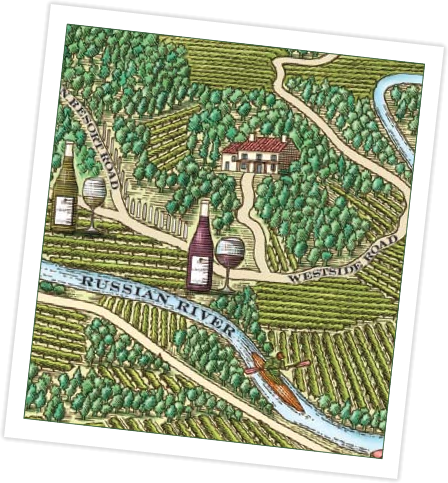 The Russian River Valley is one of the coolest appellations in Sonoma County with diverse soils and microclimates because of its tumultuous geological history. During the evening the valley is covered by thick fog sometimes dropping the temperature 40 degrees. The fog steadily retreats to the coast by mid-morning and the afternoons are warm and sunny allowing the grapes to ripen slowly and evenly. The long hang time creates full, rich flavors. The yearly flooding of the river renews the land with youthful river bottom soils supplying rich, rocky alluvium soil that nourishes vine growth. These make for some of the best conditions recognized for growing world class Chardonnay, Pinot Noir, and Cabernet Sauvignon. The Alexander Valley AVA (American Viticultural Area) sits at the top of Sonoma County with about 15,000 acres of much prized vineyards. Within the 76,000 total acres of this AVA, there are a variety of microclimates supporting a substantial range of grape varieties. While Cabernet Sauvignon reigns supreme on the gravelly terrain of the valley floor, the Alexander Valley AVA also produces notable Chardonnay, Zinfandel, Merlot, and Sauvignon Blanc. Just enough coastal fog finds its way up the Russian River Valley to create cool evening and morning conditions. This, however, gives way to hot mid-day temperatures in what is overall a relatively warm growing area. Located at the north end of Sonoma County, the Alexander Valley AVA is 22 miles in length and varies in width from two to seven miles. The valley includes the valley floor and hills to the east and west encompassing approximately 76,900 acres, with more than 15,000 currently planted to premium wine grapes. Cover crops are planted between the vineyard rows to control erosion, improve soil structure, add nutrients and host beneficial predators. Our viticulturist evaluates the vineyards each week perfectly matching water, nutrient, and trellising requirements for each vine with the soil and climate conditions. The natural growth of native plants along the property boundaries is encouraged to control invasive weeds and increase plant and animal biodiversity. Picket Fence is committed to sustainable farming practices. Sustainable farming produces healthy soils and fruit.